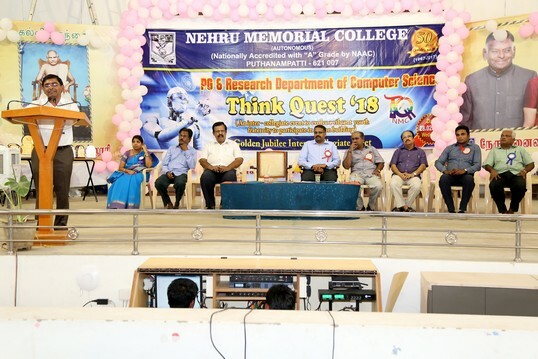 The Post Graduate and Research department of Computer Science of Nehru Memorial College has been successfully organizing Think Quest an Intercollegiate competition since 2012, to enhance , inspire, and motivate the students of various institutions , who had participated in various events & to motivate & energize our students to widen their knowledge. This is the successful 7th year. 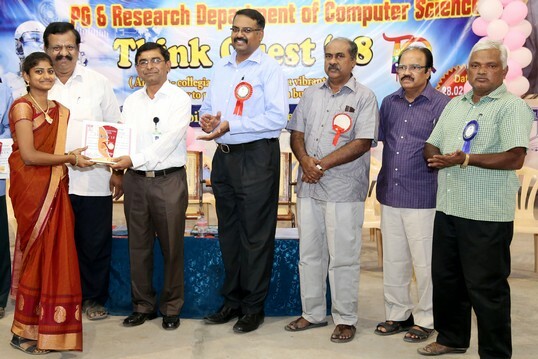 This year also the Department of Computer Science had organized Think Quest '18 for Post graduate and Under Graduate Students of various institutions. Mr. Suresh R R, Project Delivery Head, Client Linx Software Pvt Ltd, Chennai, our illustrious alumnus delivered the valedictory address on the occasion of Think Quest 2018 an Inter Collegiate Competition organized by the Post Graduate Department of Computer Science on 28.02.2018. He addressed the students that it is a great thing to be at your age, an age where you can follow all your dreams. But also you can change your dreams, paths to explore the world. He further opined that the students have plenty of opportunities and skills which they have never dreamed off. The students should imagine the kind of impact they are going to make in the society. We should inspire others and the Nehru Memorial College is providing best platform to horn your skills. You should mould yourself and should explore the world of knowledge which will help you to climb up in the ladder of your carrier. He thanked all the faculty members for their active contribution to the student community. Seven different events had been conducted by the Department of Computer Science in Think Quest 18. They were Dumb charades, Short Film Making, Ad-Mad & Web Design for UG Students and CraCKode, Treasure Hunt & Tri Code for PG Students. In these competitions nearly 112 participants from various colleges registered their names in various events. All of them enthusiastically participated in all the events and performed well. 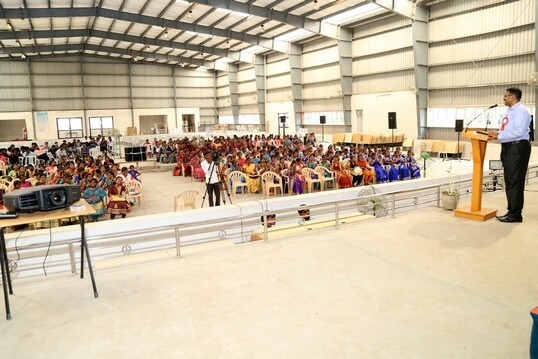 The participants were from the colleges like, Jamal Mohammed college, Srimad Andavar College, Bishop Heber college,St.Joseph College, National College, Thanthai Hans Roever College, Meenakshi Ramasamy College, Imayam College, Dharmapuram Ganambigai College of Arts and Science for Women and MAM college of Engineering & Tech. Participants gave their feed back about the programme and appreciate the management, Principal, HOD and faculty members of the department. At the end of the programme St.Joseph's College, Trichy lifted, Think Quest 2018 overall trophy. Cash Awards and Prizes were also distributed for the winners of the events. 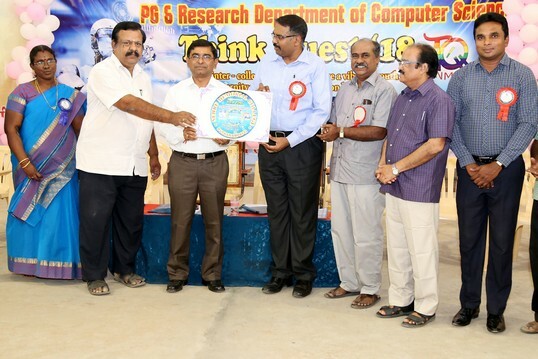 Optra '18 an intra departmental competitions were conducted for the students of our PG & Research department of computer Science and Prizes were also distributed for the winners of Optra '18 in TQ '18. 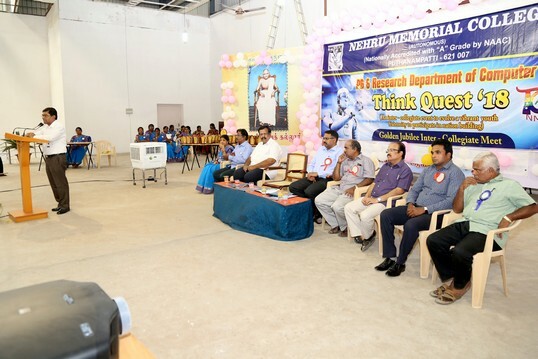 Our Principal, Dr. A.R.Ponperiasamy inaugurated Think Quest '18 at 10.30am this morning. Electronic lamp was lightened by our principal Dr. A.R.Ponperiasam, our Head of the department Prof.M.Muralidharan and our senior faculty members Prof. M. Asokan, Dr. S. Murugan, and Dr. K. Mani. Er.Pon.Balasubramanian, President, College Committee, released the magazine "view port" and offered the felicitation. Dr. S. Kumararaman, Vice Principal offered felicitation .Prof. M. Muralidharan, Head of the Department welcomed the gathering. The programme was coordinated by Assistant ProfessorsMrs.V.Priya, Mrs.R.Jaya and Mrs.K.PonvelAzhagu Lakshmi. Optra '18 was coordinated by Professors Mrs.D.Jayachitra and Ms.P.Kalpana.